This representation of an official is slightly larger than life-size. 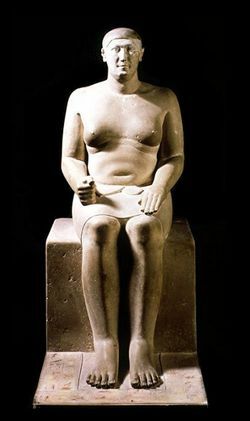 He is seated on a square block without a back support set on a pedestal which extends beneath his feet. The chest with its folds of flesh has been rendered in great detail. The right hand is fisted and the left hand is open; both are placed on the thighs. He is dressed in a knee-length kilt tied at the navel. The full face appears to have a double chin and gives the impression of being oval because of the short neck. The furrow between the nose and upper lip has been rendered with care and this makes the face seem lifelike. The outlines of the lips are clearly marked. The ears are not covered by the hair, which is rendered as a skull cap. The toes have been carefully separated from each other and even the cuticles have been indicated. A similar concern for detail may be observed with the fingers, where even the folds on the joints are visible.
" Hereditary Count, Vizier), Sealbearer of the King of Lower Egypt, Guardian of Nekhen, Mouth of all (people) of Pe"
" Priest of Bastet, Priest of Shesemtet, Priest of the Ram of Mendes"
" Staff of Apis, Staff of the White Bull, who loves his lord"
" Eldest of the Palace, 'Greatest of the Five' (in) the House of Thoth, who loves his lord, the Sole Friend"
" Overseer of the Royal Scribes, ...(? ), Director of the Singers of Upper and Lower Egypt, Overseer of all royal works, Bodily Son of the King, Hem-iunu." Roeder, G., Die Denkmäler des Pelizaeus-Museums zu Hildesheim, Hildesheim 1921, S. 48, Abb. 1. 7. Junker, H., Gîza I : Die Mastabas der IV. Dynastie auf dem Westfriedhof (Akademie der Wissenschaften in Wien: Philosophisch-historische Klasse, Denkschriften 69.1), Wien; Leipzig 1929, S. 153-157, Tf. 18-23. Wolf, W., Die Kunst Ägyptens : Gestalt und Geschichte, Stuttgart 1957, S. 138-140, Abb. 101-102. Kayser, H., Die ägyptischen Altertümer im Roemer-Pelizaeus-Museum in Hildesheim, Hildesheim 1973, S. 47, Abb. 15-16. Porter, B. & Moss, R.L.B., Topographical Bibliography of Ancient Egyptian Hieroglyphic Texts, Reliefs, and Paintings, vol. III².1 : Memphis, Oxford 1974, S. 123. Eggebrecht, A. (Hrsg. ), Das Alte Reich : Ägypten im Zeitalter der Pyramiden, Hildesheim - Mainz 1986, Kat.-Nr. 3. Martin-Pardey, E., Grabbeigaben, Nachträge und Ergänzungen (Corpus Antiquitatum Aegyptiacarum: Pelizaeus-Museum Hildesheim, Lieferung 6), Mainz 1991, S. 126-134. Eggebrecht, A. (Hrsg. ), Pelizaeus-Museum Hildesheim : Die ägyptische Sammlung, Hildesheim - Mainz 1993, Abb. 11.